Faith Vigil, center, saved her family – and their two dogs – from carbon monoxide poisoning. Thanks to Vigil’s quick thinking, everyone is healthy again. 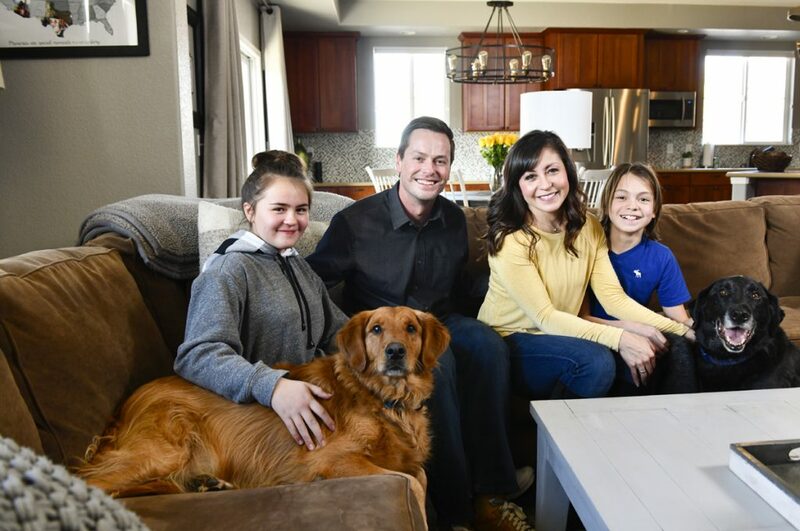 From left to right, daughter, Mila, 11, with Zeb, a golden retriever, Paul Schreder, Vigil, and Will, 14, with Jackson, a black lab. Photo by Cyrus McCrimmon for UCHealth. The sun streamed into the bedroom where Faith Vigil was waking up with her 11-year-old daughter at her side. She felt the warmth on her face, looked over to see her daughter peacefully breathing and felt a deep sense of relief simply to be awake. A day earlier, carbon monoxide poisoning from a faulty furnace nearly killed Vigil’s entire family. 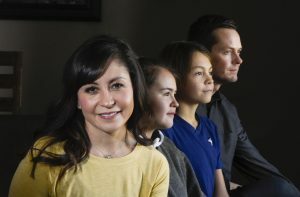 One by one on New Year’s Day, Vigil, her husband, Paul Schreder, their son, Will, 14, and daughter, Mila, had woken up feeling lousy with pounding headaches and nausea. One of the dogs, a golden retriever named Zeb, was pacing and whimpering. At first, Vigil and Schreder thought they might have the flu. Last winter, three family members had gotten it within hours of one another. Or maybe it was food poisoning from a New Year’s Eve party the night before. But, as family members curled up under blankets on the sectional in their family room, Vigil, who is a high school teacher, fought through the haze and pain in her head and had the presence of mind to do a little research. She checked on her phone for symptoms for this year’s flu strain. No. They’d have fevers, coughs and sore throats. She texted her friend who hosted the gathering the night before. Was anyone sick at their house? No. Then, out of nowhere, Vigil thought to look up carbon monoxide poisoning. The search results were stunning and matched their symptoms exactly. “We’ve got to get out of here,” Vigil told her husband and kids. Each scrambled to get dressed. Vigil and Schreder loaded the kids and both dogs into their truck and started driving. At first, they considered going to Vigil’s parents’ home. Then, Vigil realized they needed medical attention. Dr. Patricia VanDevander was on duty. She immediately checked each member of the family and recognized that Vigil was the opposite of crazy. She was a hero. “I totally credit this mother with saving all of them by getting prompt treatment,” said VanDevander. Mila Schreder, 11, wears an oxygen mask at the UCHealth Emergency Room – Smoky Hill. 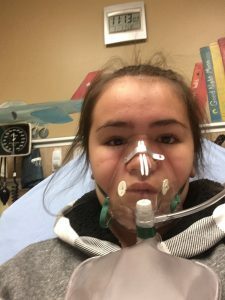 Mila, her brother Will, 14, and their parents all had to be treated for carbon monoxide poisoning after a faulty furnace filled their home with the deadly gas. Photo courtesy of Mila Schreder. “I can’t tell you how proud I am of her for putting things together so quickly and getting them all in so quickly. That was just extraordinary,” said VanDevander, who has been practicing emergency medicine for 26 years and never has had an entire family walk in with such an accurate self-diagnosis of carbon monoxide poisoning. Carbon monoxide is extremely dangerous because poisoning victims often fall asleep and never wake up. That’s exactly what she and her team did. They took blood samples from all four family members and immediately started them on treatments of high-flow oxygen by masks. The blood samples later showed exactly what both Vigil and VanDevander suspected: high levels of what’s called carboxyhemoglobin. For non-smokers, these levels should be no higher than 3 percent. Schreder had the highest levels in the family: 33 percent, while Vigil’s test results showed 26 percent and both kids were at 23 percent. The treatment is relatively simple, but requires patience: sustained doses of oxygen over several hours. VanDevander credited both Will and Mila with being great patients. Each kept oxygen masks on for about four hours straight. Their parents, meanwhile, kept the masks on between calls to Aurora Fire Rescue and Vigil’s dad, who worked on finding a furnace expert on a holiday to try to determine the cause of the carbon monoxide leak. Aurora Fire Battalion Chief Steven Wright was on duty when the call came in about a carbon monoxide leak at the Tallyn’s Reach home. Vigil’s dad had reached a furnace expert, but after getting an initial reading of high carbon monoxide levels outside, the worker wouldn’t step foot in the house. He knew it was too dangerous, so he called Aurora Fire. Wright and a team of ten firefighters responded. They had to suit up with masks and oxygen tanks to safely enter the home. Get furnaces and gas appliances inspected regularly, especially after a new construction or remodeling. Never use charcoal grills or generators to generate heat in a closed space. Trust your gut. When in doubt, get out. If your carbon monoxide detector is going off or you feel sick, leave the home immediately and call 911. Inside, they found levels of carbon monoxide from the basement all the way up to the second story that measured at 500 parts per million. Anything over 35 parts per million is considered poisonous and requires rescue works to wear oxygen masks. “If you succumb to the carbon monoxide and go to sleep, you’re never going to wake up,” Wright said. Paul Schreder and Faith Vigiil always assumed their furnace was safe becase their home is relatively new. But the furnace may not have been installed correctly. Faulty venting caused the couple’s home to fill with dangerous levels of carbon monoxide gas Photo by Cyrus McCrimmon for UCHealth. The repairman later found that the furnace was not vented properly. After the leak, they are taking no chances. 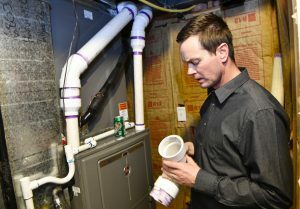 They installed a new furnace and air conditioning unit along with six carbon monoxide detectors throughout the house. And Vigil has been notifying all their neighbors because homes older than 2009 were not required to have carbon monoxide detectors. A law passed that year requires all new homes, rentals and properties for sale to have carbon monoxide detectors. Vigil and Schreder previously had bought detectors, but like many people, hadn’t recently checked on the batteries. Wright said carbon monoxide poisoning can occur in any home – new or old – and is common when there’s been recent construction work, especially roofing. Sometimes pounding on the roof or elsewhere in a home can jostle furnace vents that must lead outside. Other people suffer from carbon monoxide poisoning when they warm up cars in garages or use gas appliance, heaters or generators in closed spaces. For prevention tips from the U.S. Centers for Disease Control and Prevention, click here. The great news for Vigil, Schreder and the kids is that they should not face any long-term health effects from their carbon monoxide exposure. Their doctors say that’s because they sought help right away. VanDevander credits her team, too, with providing excellent care. The Smoky Hill ER is a stand-alone neighborhood facility. Because it’s relatively small, the ER normally doesn’t keep large supplies of oxygen on hand. But VanDevander wanted to keep all the family members together and avoid transferring them to separate hospitals for adults and children. So, a nurse named Karen Nerger came in on her day off and quickly arranged for the delivery of two additional large tanks of oxygen. The ER also doesn’t have a cafeteria, so Nerger took orders from the family members and ran to a nearby Panera to buy lunch for them. A regional nurse manager, Veronica McKim, also came in to help. Freestanding ERs are for true emergencies, VanDevander emphasized. “And this was a true emergency. We’re all board-certified emergency medicine physicians. You can’t be a new graduate. You have to have experience,” VanDevander said. Vigil and Schreder may never know for sure exactly when the furnace vent stopped working. The family had been out of town after Christmas and everyone returned on Dec. 30. After the neighbor’s party, everyone returned home and went to bed by about 11 p.m. Even the dogs were out of sorts. :Doctors credited Faith Vigil with saving her family after she realized they probably had carbon monoxide poisoning. Photo by Cyrus McCrimmon for UCHealth. “My retriever seemed super nervous, but I didn’t connect the dots right away,” Vigil said. Fortunately the dogs, Zeb, the retriever, and a black lab named Jackson, ended up being just fine as well. Thankfully, Vigil and Schreder brought the dogs with them when they left their home. They stayed in the truck for a while, then a neighbor came and took the dogs to her house while the family members did their oxygen treatments. Vigil said when she spoke to the fire chief and learned how high the carbon monoxide levels were throughout the house, the close call the family suffered really hit her. Vigil always has been vigilant about stimulating the kids’ brains and keeping them safe. Back when she was pregnant, she read to her babies in her belly. She was careful about protecting their ears from loud sounds and feeding them healthy foods. Vigil and Schreder’s furnace has been inspected at least three times, but no one ever noticed that the exhaust pipe was not properly glued to the furnace. Paul Schreder says his wife is the family’s hero. When everyone felt sick on New Year’s Day, Schreder thought they might have the flu. He was tempted to curl up and go to sleep. Faith Vigil suspected carbon monoxide and got everyone out of the house. 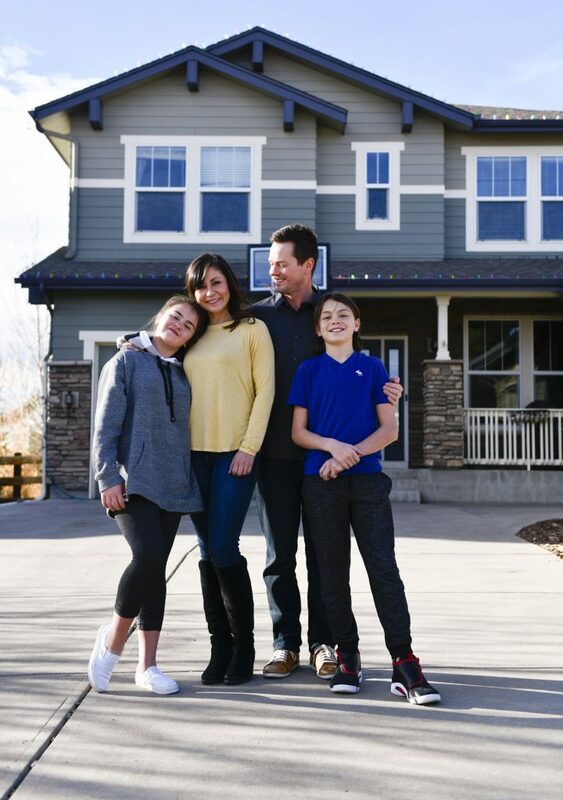 Photo by Cyrus McCrimmon for UCHealth. The couple now is urging everyone they know to get carbon monoxide detectors and test them regularly. As for the help they got, Vigil said the ER team was great. Schreder credits his wife with getting the family out to safety. “My inclination was to give the kids medicine and put them to sleep,” he said. “Faith is definitely our hero,” he said.